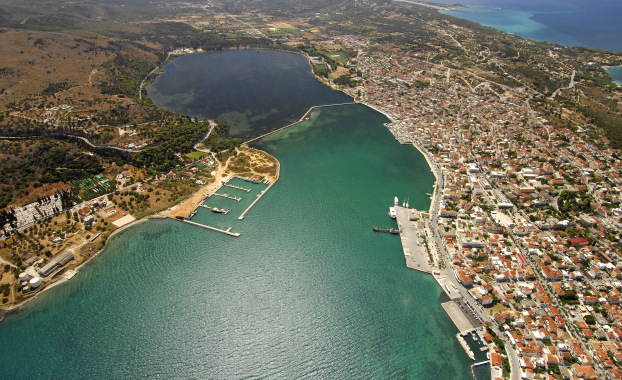 Argostolis attractions are mostly within walking distance of the port. The meeting point in the city is Vallianos Square surrounded by shops, taverns and other businesses. A couple blocks south of the square is the main shopping street, Lithos-troto, which is a pedestrian-only cobble shopping mall. There are two nice small museums in the city. The Archaeological Museum has artifacts from Mycenaean to Roman times. The Korgialeneios History and Folk Art Museum includes many dis-plays showing the island prior to the earthquake. The picturesque De Bosset Bridge was built of wood in the early 19th century, but replaced a few years later with stone. It is one of the city’s most popular photo spots along with the Doric-style lighthouse rebuilt after the earthquake. On a hill south of Argostoli is St. Georges Castle. Located in a village called Kastro, the castle was built by the Venetians on an older Byzan-tine structure in the first half of the 16th century and served as the is-land’s capital for over 200 years. 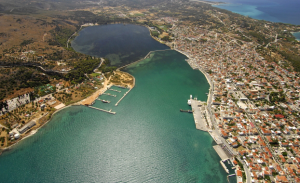 Very close to Argostoli are the island’s most popular beaches, Platis Gialos and Markis Gialos. Essentially it is a long beach which is sepa-rated by a cluster of rocks. The spotless golden sands and beautiful blue waters of the Ionian are some of the elements that make them widely known. These beaches are very well organized for the tourist housing canteens, sun beds, umbrellas and showers. Also there are many water sports for the visitors to enjoy.